Founded in the late 1950s, Aza International invented the rope transport system, a revolutionary product that helped develop today’s modern livestock husbandry. Aza International has always been recognized as a leader in the production of systems for the transport and automatic distribution of livestock feed and is a company name that, over time, has become synonymous with innovation and reliability. In recent years, Aza International has been present in China with a branch office near Shanghai, where Mr. Bruno Frugnoli can be contacted at frugnoli.export@azainternational.it. Over the years the Chinese branch has sold and installed sev­eral plants in various areas of China, not only in the poultry sec­tor, but also in the pig and industrial sectors. 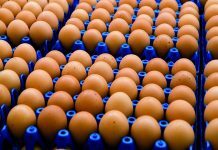 The major Chinese companies are very satisfied with the company’s quality and many of them are contacting Aza International again for further restructuring or for the construction of new breeding farms. The Italian company intends to continue presenting their new high quality products to this growing and expanding market. 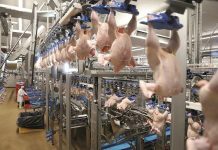 Their range of products for both the poultry and pig sectors is more than capable of keeping up with the demands of an increasingly specialized market. The latest innovations include large-capacity conveyors capa­ble of transporting up to 12 cubic meters/hour. Constructed of premium stainless steel materials and now available in diam­eter 76 and 114 mm with curves and feed outlets available in various shapes and materials depending on the type of product to be conveyed. They are the ideal solution for those customers who need to transport large quantities of feed. This new range complements the well-known 60 mm diameter equipment and, as such, allows for the construction of long external tracks for the loading of silos. 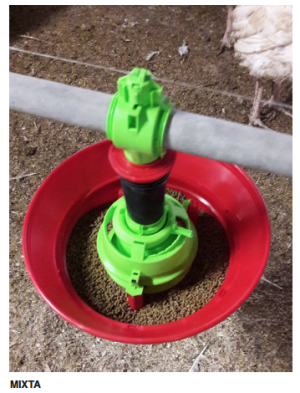 In the poultry sector, the new MIXTA feed pan, introduced at the last Space Trade Fair, is being successfully used on duck farms and on farms operations with mixed cycles of chickens and turkeys flocks. 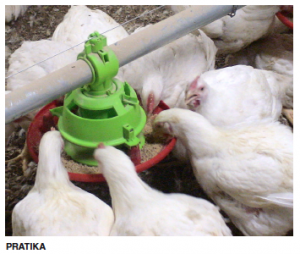 Enormous success has also been regis­tered by the PRATIKA feeder for broilers which guarantees an optimal distribution of the feed. All these products are appreci­ated for their ease of use and are completely automatic over all the various growing stages. 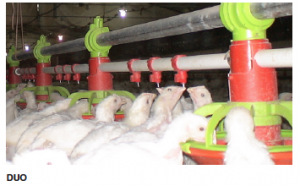 The original DUO system for broilers has automatic regulation and is characterized by combining the feeding line with a wa­tering line. This reduces animal movement creating more free space in the shed and also incorporates a single lifting system for both the water and feed lines. 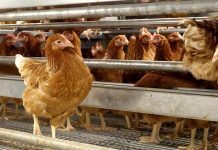 The innovative BREEDAZA linear trough feeder system is par­ticularly suitable for chicken breeder flocks and egg layer flocks housed either in cages or on the floor. The BREEDAZA system ensures a fast and homogeneous distribution of feed along the entire line and the animals can feed and empty the feed line completely at the end of each distribution of food. At the end of the growing cycle the cleaning operations are simple and fast. It requires only one lifting unit and a single load point even for 300-meter-long systems. This allows for the silo to be located at the end of the shed and not just in the centre. The revolutionary SELF-DOSY feed pan is another product that Aza International is presenting to their customers. This is a stur­dy feeder, designed specifically for breeder males. The system incorporates an innovative volumetric dozer with centralized regulation. This allows one to instantly change, across the line, the amount of feed to be distributed to the feed pans with quan­tities being based on the reproductive cycle of the males. This system does not require external weighing systems and lines do not need to be raised during the filling phase thus simplifying all the in house engineering. 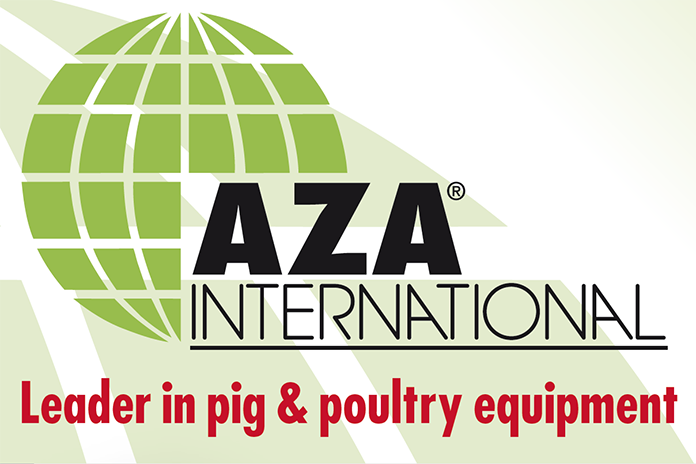 While we have listed above some of the main products for the poultry industry, one must also remember that Aza International is able to offer its customers in the pig sector a wide range of equipment and feeding systems suitable for every need. The history of Aza International travels in parallel with the world livestock breeding and their products and inventions have marked fundamental evolutionary moments in this sector all over the world. Aza International is a leading name in the world and for over forty years has been a name synonymous with high quality and reliability of their products including guarantees on assistance and spare parts. Previous articleJo Dee Messina to perform at 2019 MPF unhatched event!